When the latest series of the BBC's Sherlock, a modern-day reimagining of Sir Arthur Conan Doyle's classic detective stories, was aired on China's video hosting websites on January 2, five million watched. Online fan clubs of Sherlock have also formed with thousands of members enthusing over Benedict Cumberbatch's cheekbones. The official Chinese newspaper People's Daily said this season's first episode had a "tense plot, bizarre story, exquisite production, and excellent performances." All of these have been picked up by the UK media, who have reported China's "Sherlock mania." But the media really don't have to make a fuss about it. US TV series from Friends in the 1990s to the recent The Big Bang Theory that features awkward yet funny characters, and then British dramas such as Downton Abbey and Doctor Who, every one of them suits the "China falls for the X effect" pattern. Yet Chinese audience's fever for overseas TV series provokes questions. Sherlock, as well as being a good show, also encapsulates certain visions of Englishness for Chinese, for whom the UK is still an alluring country. When it comes to US series like Friends or The Big Bang Theory, what attracts Chinese audience might be the humorous and vivid way in which the writers explain life and illustrate popular US culture. The younger generation are keen to know about the outside world, reflect upon the world in a self-mocking way, and discuss what living is about. 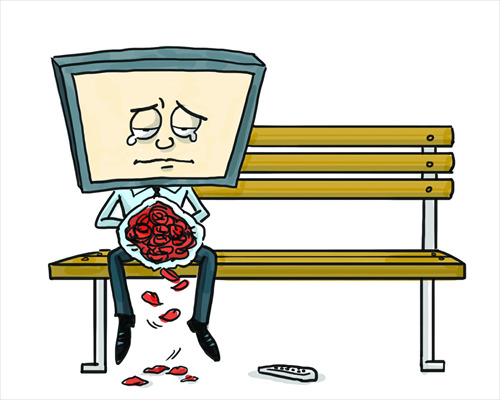 The vast majority of Chinese TV series, however, fail to offer anything the young can connect to. As well as cardboard sets, shoddy writing, and recycled plots, domestic dramas still shoulder the responsibility of conveying ideological messages rather than putting entertainment first. There are rare exceptions. In the early 1990s when China was at the initial stage of its development path and society began its moral collapse, one telenovela, Aspirations, caused a sensation. It traced 20 years of hardship, frustration, joys and sorrows of ordinary families after the Cultural Revolution (1966-76), and featured a heroine that was obedient, caring and helpful. This touching, teary soap opera reflected the realities of Chinese society. But attempts to deal with social issues, especially when operating under restraints that leave some topics off limits, may actually harm entertainment. When discussions about China's vulnerable pension system became popular, TV series that reveal China's aging problem and call for caring of the elder people started to blossom. The harsh realities depicted in such series, though hoping to convey a warm-hearted message, left audience breathless. And war stories, especially about the anti-Japanese aggression war, have never been off Chinese screens, especially in recent years. But the crude and stereotyped plots, in which heroic Chinese fighters easily fend off hordes of subhuman Japanese soldiers, have raised sarcastic queries from viewers. It is time that China's TV industry learns how to produce real cultural works. When our TV series struggle with outdated ideologies and social ills, cultural innovation, a term both authorities and the public like to stress, will pass us by. There is a long way to go, and we cannot just cheaply imitate Western shows. Take the recent show IPartment, although "inspired" by Friends and The Big Bang Theory, it suffers from one crucial flaw: It's not at all funny. Only if we can hit the mixture of good writing, good acting, and good topics, will TV audience stop turning to the West for their entertainment.